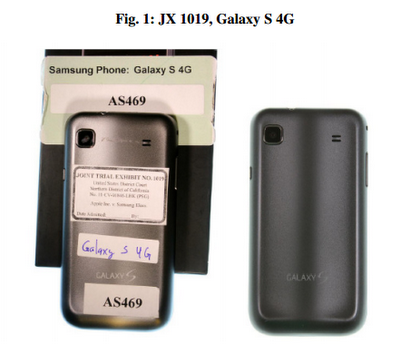 Samsung just brought a motion for a court order to "to label joint exhibit devices in a manner not obscuring trade dress". 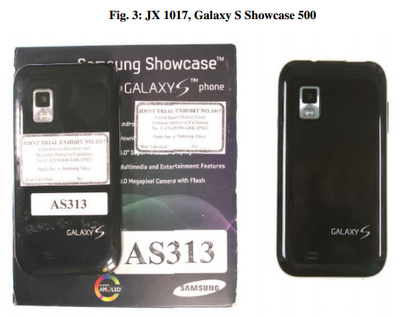 Apple apparently has custody over those joint exhibit devices, most of which are Samsung devices. According to Samsung's representation, Apple just recently attached large exhibit labels to the backside of those devices. 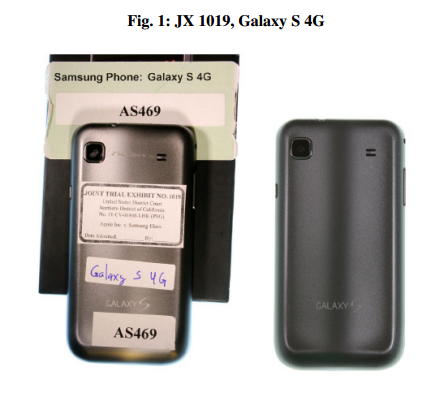 Samsung also showed an email from Michael Jacobs of Morrison & Foerster, in which he told Samsung's counsel that Apple "will not agree to anything other than full exhibit labels" and reiterated his belief that "[t]he jury will not be confused". If there's any major difference in overall impression between the pictures on the left side (labeled exhibits) and the right side (unlabeled products), it's that the quality of the photographs on the right side is much higher. But even a low-quality picture shows that Apple didn't attach stickers that would hide any design element. Samsung's motion uses the word "obscure" countless time, but where there is nothing, nothing can be obscured. Samsung's motion accuses Apple of "e by covering up large portions of the backs of the devices, by blotting out textures, shapes, colors and other information that consumers see", but I don't see that any distinctive elements get lost this way. 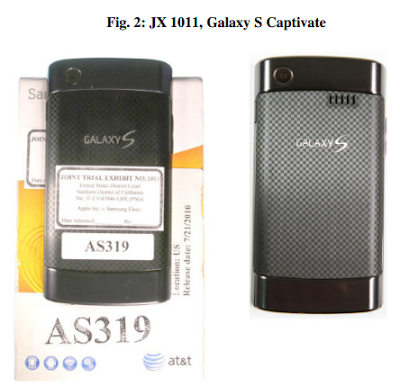 One example Samsung points to is that "the Galaxy S Captivate has a distinct checkered back panel that was significantly obscured by Apple's labels". Apart from the differences in image quality, there's no doubt that the checkered backside is still visible all around Apple's stickers, and any intelligent person will understand that the backside of that device is checkered in those covered areas. Samsung's motion makes much ado about nothing, though I would agree that those stickers could be smaller and still serve their purpose.